Welcome to this week’s Q&A installment, with the question of “How do I get better at sight reading?” This is a question near and dear to my heart, since sight reading (the act of looking at written music and being able to play it) was never one of my strong suits, and I avoided it as much as I could. Now, as someone who teaches kids and adults to read music, I’ve come up with some tips and ideas for becoming better at this difficult skill. I’m still not what you’d call a great sight reader, but I’m infinitely better than I used to be. Sometimes quantity will in fact lead to quality. I wasn’t a very good sight reader growing up, but then, I never practiced. When I learned a new piece, I memorized it quickly so I didn’t have to rely on the page. As an adult, I try to sight read something every day – just for 5 or 10 minutes. Instead of doing Sudoku, go to the piano and just read some music – it’s great for your brain and it really will make you a better sight reader. 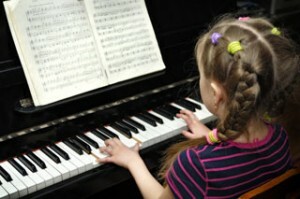 Along those same lines, try printing out music and using it like a worksheet – write down every single note on the page. I don’t recommend this for songs you’re practicing, because instead of reading the notes you’re reading your letters, but it’s great practice away from the keyboard. Interval recognition! For those of you who don’t know, intervals are the distance between two notes. So two notes right beside each other like an A and a B would be a 2nd. A to C would be a 3rd, and so on. Being able to look at your music and quickly gauge the distance between notes is probably even more important than reading the individual letters. So print off some random music and practice writing in those intervals. If printing off “worksheets” isn’t your thing, download a note reading app, or even better, an interval recognition app. They definitely exist, and then you can practice even when you’re standing in a line or waiting for the bus. Use little memory tricks for a while, until you just automatically “know” the notes. Check out a previous video ‘tricks to reading notes‘, for specific ideas on that. Basically if you have a few landmark notes, ones that you can pinpoint immediately with no thought, the notes in between will be easier to figure out. Eventually you’ll know them ALL at a glance, but until you reach that point, it’s nice to have a few key notes. I see this with students sometimes – trying to read every single note at a time, instead of looking to the larger scope of the phrase. That would be like trying to read a book, by reading each individual letter instead of looking at the word. When you’re reading, you see the word ‘horse’, not h-o-r-s-e. Instead of just pinpointing all the letters, look at the shape. Where does your hand need to be positioned? How big are the leaps? Make sure you’re looking at the overall shape of the phrase of music, instead of each individual note one by one. Lots of sight reading problems can boil down to a problem with reading rhythms. It’s one thing to pinpoint notes and intervals, but without quickly being able to understand a rhythm, you’ll be seriously slowed down. To improve your rhythm reading – you guessed it – practice counting by printing off music and writing in the counts, or by using an app. To get better at sight reading, it might not be obvious that it would help to develop your ear as well – but training your ear goes a long way to improving sight reading. My ear is quite good and I’m adept at ‘hearing’ interval distances – for example, without looking at the piano, I can hear a 4th or a 5th and tell them apart. So if I’m looking at a page of music and I see a 6th, but my fingers don’t stretch far enough and I play a 5th, I can immediately “hear” that it’s wrong. So train your ear to hear intervals and distances, because it’s a great way to self-correct as you go. There’s a tactile aspect to sight reading, as well. Say you notice that there’s a 5th in your music. Since you’ve been practicing reading intervals, you don’t have to think about it, you look at your music and instantly know it’s a 5th. But do your fingers know what a 5th feels like? Can you naturally feel the distance, without looking at your hands? You should be able to close your eyes and feel out any type of interval, easily, all the way up to an octave. Also practicing with your eyes closed is fun. Is that just me? Hopefully this video has shown you that to be an effective sight reader, you need to develop skills in a whole host of areas – visual, tactile, aural or hearing, cerebral and so on. It’s not enough to just memorize all the notes. It’s not enough to just memorize interval distances. You need to take a holistic approach. The more you develop these skills, the better sight reader you’ll be.